Totality Software, Inc. is a privately held corporation located in San Diego, California. The company was originally named Celestial Computing, which was founded by Evan Zucker in 1988. Totality Software was incorporated in California in 1997. Totality Software's president, Evan Zucker, graduated from Duke Law School in Durham, North Carolina, and practiced law in San Diego from 1980-1982 and 1988-1996, specializing in civil litigation. In the interim, Zucker flew the F-4 Phantom II fighter jet in the United States Air Force, reaching the rank of captain. While in the Air Force, Zucker wrote his first software program, which later led to the founding of Celestial Computing and Totality Software. When Zucker returned to the practice of law as an associate attorney in 1988, his practice was primarily commercial litigation, and most of his work was on an hourly fee basis. However, a small portion of his practice consisted of contingency fee collection work. In 1991, Zucker opened his own practice, and he soon found that he needed a computer program to handle his small but growing collection practice. He bought two of the leading debt collection programs on the market, both of which cost thousands of dollars. Even though Zucker was extremely experienced with computers, he could not figure out how to run the programs. In fact, one of them was so complicated that the developer required new users to spend a full week in Alabama learning how to use their software. Zucker figured that if he was going to have to spend thousands of dollars on a debt collection program, he would be better off paying a local programmer to write one that did exactly what he wanted, and so that's what he did. When other attorneys saw his program they really liked it and suggested that he sell it. Beginning in November 1995 Zucker began selling Totality (initially under the name Easy Collect) and it has been a full-time business for him ever since. Totality Software is debt free with no outside shareholders, partners, investors, or venture capital money. That means we are not forced to release software before it is ready for release, merely to make our numbers look good. Instead, we can and do focus all of our attention on satisfying our users. Totality Software, Inc. proudly announces the official release of Totality version 5. President Evan Zucker said, "Totality 5 is the biggest upgrade we have ever offered, nearly 16 years in the making. It has more new features, improvements and enhancements than any previous version of Totality." Fully compatible with Windows 10 and 64-bit versions of Windows, Totality 5 has a fresh, new interface but still has the rock-solid calculations and functionality Totality customers worldwide have come to depend on. Totality Software, Inc. announces that it has released Totality 5 for Beta testing. The new version of the award-winning software was released to a limited number of users for testing. Collection Advisor magazine announces that Totality Software, Inc. has been selected to receive the Top 50 Collection Technology Products of 2008 Award. Totality Software, Inc. received the Top 100 Collection Technology Products of 2007 Award from Collection Advisor magazine. Totality Software, Inc. received the Top 100 Collection Technology Products of 2006 Award from Collection Advisor magazine. Totality 4 on 6 Continents. Totality Software is now in use on six continents. Noting a sale to a firm in Botswana, the company is finding that expanding collections practices worldwide are expressing interest in its products. 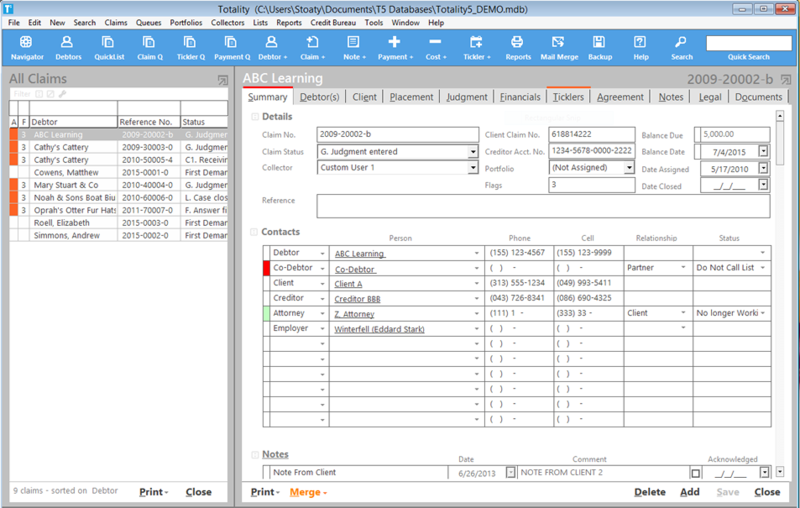 Totality Software, Inc. announces the release of Totality 4. Totality 4 is packed with more than 125 new and improved features to help law firms, collection agencies and business organizations manage their collection accounts more efficiently. Key among the enhancements is a new, more intuitive interface, a QuickList for fast claim access and the ability to calculate and administer payment agreements. The first version 1.0 of Totality was developed in 1994 for use by our president, Evan Zucker, in his San Diego law practice. The initial public version, 2.1 (which initially was called Easy Collect), was released in November 1995. It was followed two years later by Totality version 3. Totality 4 was released late in 1999 and was Y2K compatible, which was a very big concern in the months leading to the turn of 21st century. Totality 4 has been our workhouse and has been updated many times since its original release. The final update, released in 2014, was 4.6.395. The latest version of Totality, Totality 5, was released in early 2015. It sports a fresh new interface and many new features and enhancements.